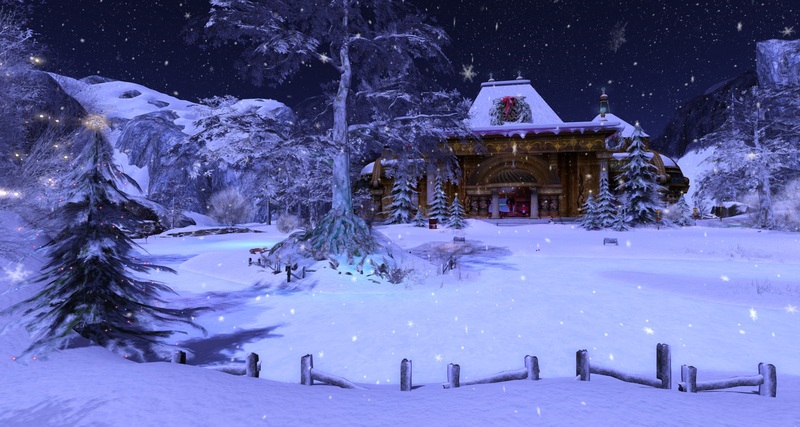 The Holiday Season Returns to Calas Galadhon Park! Both Truck and I wish those in the US the very best Thanksgiving and a wonderful and safe Holiday season for all of you across the world! As we head into our 7th holiday season (‘Calas’ was born Nov 2009) we feel fortunate and grateful that we are still here as a destination in Second Life when so many wonderful sims, builds and friends have gone. As you know by now we have opened the Calas Galadhon & Dimrill Dale sims to the joy of ice skating. If we can swing it we will put Glanduin and South Farthing in snow as well to extend skating and possible Cross Country Skiing into those areas. “The term ‘sense of place’ has been used in many different ways. To some, it is a characteristic that some geographic places have and some do not, while to others it is a feeling or perception held by people (not by the place itself). It is often used in relation to those characteristics that make a place special or unique, as well as to those that foster a sense of authentic human attachment and belonging”. We feel it is not only this ‘sense of place’ that makes the regions of Calas Galadhon Park unique in SL, but also for many, it’s the sense of community … of family … that has come to mean just as much. We’ve made many friends of our members and visitors over the years … some have become particularly close and cherished. For those of you we’ve not yet had the pleasure of meeting, we want to make sure that you know, as with ‘all’ group members, we value your thoughts, feelings and ideas. We also want to hear of any concerns … and are certainly always open to some friendly chat. Some may think we are a bit ‘too chatty’ … but meeting and talking with our visitors and members is one of the things we enjoy about being here. What fun the month of October was for us as we saw everyone having such a wonderful time on our 2015 Halloween sim build ‘Valyria’. All of the live music costume events at ‘The Cavern’ there were a great success! It was so much fun to create and such fun to see so many have a great time exploring. Thanks to everyone who helped us make the build such a success! If you’ve not heard this year’s Christmas sim size build has been officially named! ‘WHITE CHRISTMAS’. I don’t think Truck and I could have picked a better name for this year’s winter wonderland and Christmas Pavilion! We believe you will find a new magical environment for you to explore, cuddle, dance in and enjoy during the Holidays. As in years past we’ll be hosting all of our Live Music performances there for the month of December. The sim is complete with its two sleighs … couples & 4 person … both with a new pose menu courtesy of our Calas “Loon”, Hostess and dear friend; Kerena Zhangsun. Thank you Ms K! Of course, we haven’t forgotten the famous Flying Reindeer ride (always fun) and … drum roll … a new tour .. a surprise! You will love it! If all goes well, we plan to open the sim to our members and their guests this Sunday Nov 29th with the public opening on Dec 1. On Dec 2, one of our performers, Luciano Lionheart opens up The Christmas Pavilion with our first performance there for the month. Be sure to dress up in your Christmas finery … de-scripted of course ;-). We would like to keep personal scripts under 100 while at the event, 200 while visiting the sim. I was originally going to update you on what plans are being planned for the Park in 2016 but for now let’s just take in the beauty of Calas Galadhon Park and our new Christmas sim and leave that for later. Watch for the notice on Sunday morning with the landmark. As with our special previews in the past, you are welcome to bring a guest or two. All guests MUST be accompanied by a member. Please wear your tags and keep scripts to a minimum. Have a safe & wonderful Thanksgiving holiday to those of you in the US! Wishing the very best to our members during this time of year!